James Dean was an American actor who became a cultural icon of teenage disillusionment through his most celebrated film, Rebel Without a Cause. His premature death in a car crash at the age of 24 cemented his legendary status. Dean was the only actor to have had two posthumous Oscar nominations. Pier Angeli was an Italian actress whose career peaked in the 50s and won a Golden Globe award for her role in Teresa in 1951. She had a brief relationship with Dean which she broke off under pressure from her mother. She also had a relationship with Kirk Douglas and married and divorced twice, but died from a drug overdose at the age of 39. 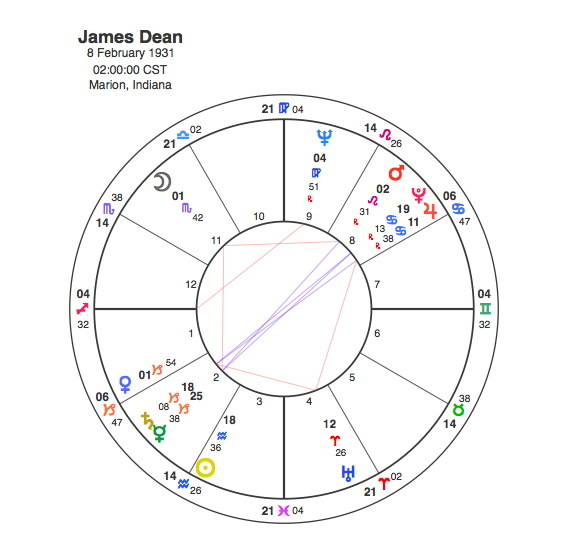 James Dean had the perfect chart for the role of troubled teenager. He had the Sun in Aquarius, the most rebellious of all signs together with Sagittarius rising which demands personal freedom. The Moon in Scorpio adds a kind of brooding emotional intensity to the mix. The Moon is the focus of a T Square including an opposition between Mercury and Mars showing the verbal and physical tensions that provided the fuel for his iconic image. He was chosen for the role because the director was looking for another Marlon Brando. Dean would probably have had as much success as Brando if not for the car crash that killed him. In 1954, Dean became interested in developing an motor racing career, understandably given the Mars / Mercury / Moon Tsquare and the Aquarius / Sagittarian love of freedom and excitement. He had considerable success in his first few races but Warner Brothers barred him from all racing during filming. It was on his way to a race meeting that he had the accident that killed him in September 1955. The 8th house traditionally rules death and although it would be highly unlikely that the vast majority of us could predict our deaths from our charts, it does seem the case that if one’s death is unusual, the 8th house will often show the appropriate symbolism. Dean’s chart shows Mars, Pluto and Jupiter in the 8th house, particularly apt symbols for sudden death in a car crash. Mars is also part of the T Square opposite Mercury so the tensions caused by his love of driving and racing ( Mercury opposite Mars ) focused onto the Moon in Scorpio. Mars in the 8th house and in exact square aspect to the Moon in the 8th sign clearly points to his demise. This however was not Dean’s first experience of death. His mother died quite suddenly when he was nine years old. The Moon in a chart rules the mother and Pluto was conjunct Mars and square the Moon in 1940 when she died. The big turning point in Dean’s life came in 1951 when he dropped out of law school to become an actor. Pluto was opposite his Sun from 1950 – 52. One unusual aspect of Dean’s chart was that he had two T Squares, the second one also involved the 8th house from the Jupiter / Pluto conjunction opposition to Saturn focusing onto Uranus. The two T Squares showed the level of tension in all aspects of Dean’s short life , but when the two were linked together he died in the car crash. On September 30th 1955 Uranus the focus of one T Square was conjunct Mars and square to the Moon. Uranus conjunct Mars is traditionally an aspect that creates accidents and with all the 8th house symbolism of the birthchart and the transit, his death was inevitable. There are some striking similarities between James Dean’s chart and that of his one time lover Pier Angeli. They both have their Ascendants in early Sagittarius and both have TSquares involving the Moon and the 8th house. They both have a Tsquare focusing onto Uranus and Pluto is one of 3 planets in their 8th house. Pier Angeli had her Sun in Gemini in the 7th house. Relationships would therefore be the core area of her life. She also had the Moon in Capricorn opposite Venus an aspect that would suggest it would be hard to get the emotional fulfillment that she needs from a relationship. The Moon in Capricorn often indicates someone who is a bit if a loner, which would be an anathema to the 7th house Gemini Sun. 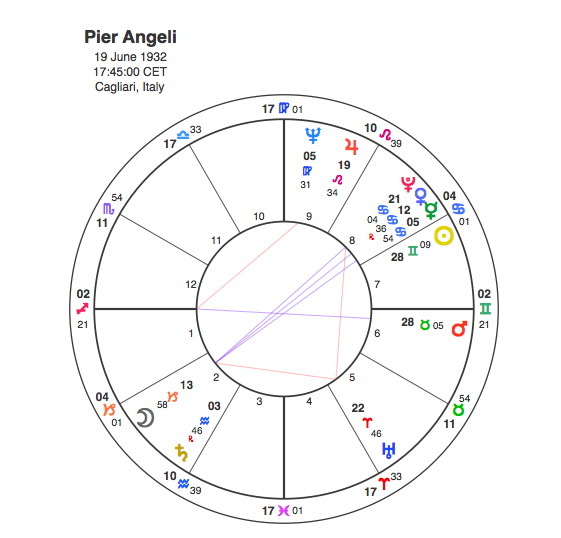 Angeli’s Moon opposes her 8th house planets and her death was the result of a drug overdose but there is a suggestion that it may have been caused by a period of unhappiness and loneliness after her second divorce. She died in 1971 with Pluto in square aspect to her Moon, carrying out the threat of the natal opposition. All unexpected deaths of young people are tragic, but we can see that some lights are destined to burn brightly while alive but be extinguished early. Both James Dean and Pier Angeli had that love of life that Sagittarius rising gives but their 8th house dwellers and difficult aspects and transits of Pluto and Uranus meant they left early leaving their audiences wanting more.